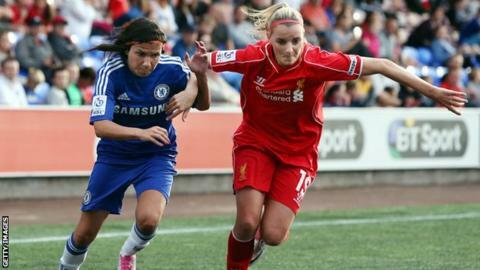 Debutants Liverpool will face 10th seeds Linkopings of Sweden in the last 32 of the Women's Champions League. Thirteenth seeds Glasgow City, aiming to reach the last 16 for a third time, face Polish side Medyk Konin. Bristol Adademy, who were 16th seeds for the draw, will take on Irish champions Raheny. The round of 32 first-leg ties are on 8/9 October, with Liverpool at home for the first leg and the other two British sides hosting their second legs. Liverpool, winners of the English title for the first time but unseeded for the draw, face opponents who finished third in their domestic league but have taken the place of runners-up Tyreso in European competition. The Swedes, who reached the quarter-finals in their last appearance in the tournament in 2010-11, will provide stiff competition as the Reds attempt to set up a last-16 tie against either Stjarnan of Iceland or 2009 runners-up Zvezda-2005 of Russia. Liverpool manager Matt Beard said: "It will be tough but I'm pleased with the draw. "We've avoided the big hitters like Wolfsburg and PSG and we've got a decent chance of progressing. "We should have players with long term injuries back by the time the tie comes round so hopefully we'll be at full strength. "I saw Linkopings play Arsenal in the competition a couple of years ago and I'll go over to watch them again before we play them." Glasgow, who have won seven successive domestic titles, will hope to progress against a team who have the fourth worst ranking of the 32 remaining participants. Both City and Medyk Konin had to come through the qualifying tournament to reach the last 32, with the Poles scoring 21 goals - seven by 17-year-old Ewa Pajor- and conceding only one in their three matches. Glasgow head coach Eddie Wolecki Black said: "It is fair to say the overall draw has been kinder to us than in previous seasons. "We do not know a lot about the Polish side. However, we will endeavour to find out as much as possible about them. "They dominated their group with emphatic wins over all three opponents and scored plenty of goals in the process. "In addition to several internationalists from both Poland and Croatia, they have a very talented young striker who is attracting attention from across Europe. "Our ex-goalkeeping coach, Bosko Lucic, is on their staff and it will be a familiar trip to Scotland for him. Glasgow City qualied for the last 32 of the Women's Champions League for the fourth year in succession. "We will need to perform at a high standard to progress again this year and if we make it through then we can speak about any potential opponents." The winners of Glasgow's tie will face either Osijek of Croatia or Zurich Frauen of Switzerland, both of whom have lower European rankings than the Scots. Bristol, England's runners-up, would face the winners of either Slavia Prague of Czech Republic or Barcelone of Spain if they defeat the competition's lowest-ranked side Raheny, having also come through the qualifying competition to reach the last 32 for a second time. Holders Wolsburg, of Germany, take on Norwegians Stabaek in the last 32.